Mrs. Siriwat Thirasak, the deputy director of Administration Bureau, Thailand Tobacco Monopoly, gave a financial support of 500,000 baht to the Princess Maha Chakri Sirinthorn?? 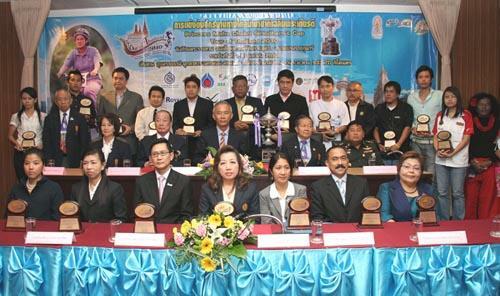 ?s Cup Tour of Thailand 2010 on occasion of the 55th Anniversary of Princess Maha Chakri Sirinthorn?? ?s Birthday on April 2 2010, in which the route is from Ubonratchathani ??? Mukdahan ??? Nakornpanom, in total distance of 933.70 kilometers between April 1- 6 2010, at Meeting Room 222, Zone E, Rajamaggala National Stadium, March 22 2010.